PLEASE NOTE: The below directions apply to our SUNDAY PROGRAMMING. For Friday Delegate Drop Off directions, PLEASE CLICK HERE. 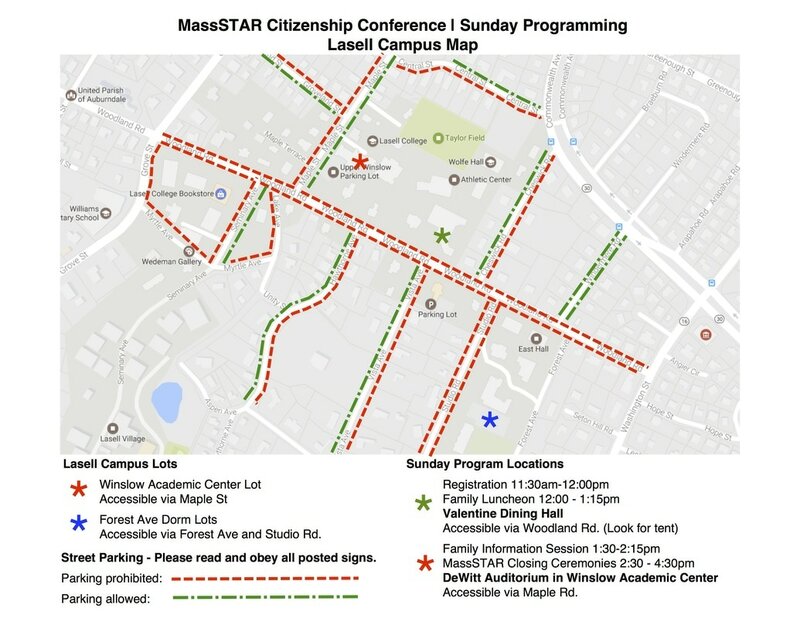 Due to construction on the Lasell College campus, we will be utilizing several parking lots for Sunday's programming. If any member of your party needs assistance due to mobility issues, we will do our best to accommodate your request. Please contact our Operations Directors, Chris Ackerman and Philjay Solar, to request mobility assistance, and we will advise you on the best parking options and ensure that a space is held for your vehicle. Street Parking: There are a number of street spaces throughout Lasell College's campus, including along Maple Street, Seminary Ave, and Forest Ave. Please pay attention to posted parking restrictions; the Massachusetts Youth Leadership Foundation is not liable for any tickets or towed vehicles resulting from illegal street parking during the event. For a downloadable PDF of the below campus map, please click here. Please note that the street parking guidelines provided below are subject to change, so please review all posted signs when parking. The indicated Lasell College lots have been approved for use by the Massachusetts Youth Leadership Foundation guests for our Sunday programming.